"...her prose takes you on journeys that transport you to other times and places." Public relations copy and content for small businesses and nonprofits. *My focus has often been Louisiana history and culture, especially the Mississippi River and the legendary Mississippi River Road. *I've also written about natural history, arts, and food and the occasional personal essay. *In fact, as an enthusiastic and curious traveler through life, I try to find subjects wherever I go. Any subject can be made interesting...at least once. And curiosity, insight and humor (where fitting) matter. I'm always open to new experiences, ready for challenging assignments. A children's book set in the Louisiana wetlands about a little boy and his near-sighted retriever. Order from Amazon. 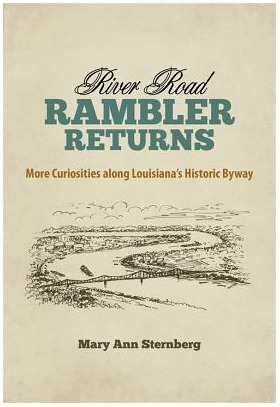 "...a fascinating, nicely-turned story and important addition about Louisiana's largely underappreciated (waterway) and its indispensable place in the history and fabric of the state." 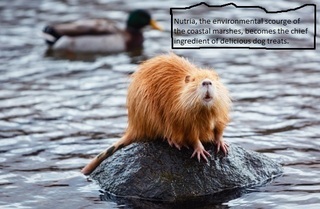 Nutria are helping devastate the marsh; bounties on their tails help control their population. But what can be done with the rest of the animal? A small Louisiana company takes a stab at it.